In 10 Ways You Can Use Overlays to Increase Website Conversions, we covered how overlays are attention-commanding content boxes that appear over your page’s content. By delivering a moment of focused interaction for your website visitor, they can help increase your website conversions. But not all overlays are created equal. Poorly-implemented overlays will annoy and alienate visitors. On the other hand, effective overlays can grow your mailing list, reduce shopping cart abandonment, increase sales and help accomplish nearly any other website goal. Read on for some techniques on how to take your overlays to the next level. Effective overlays tend to have a small amount of simple, focused text within an attractive, bold visual design. Keeping in mind that overlays appear without the visitor asking for them, it’s important not to overwhelm or scare away visitors with too much text, overly-complex messaging or an off-putting design. Additionally, the call-to-action (CTA) should be clear and concise. It also helps for the CTA to be benefit-oriented and to use action-oriented language, such as Download, Try, Reserve, Learn, Join, Sign Up, Get or Start. Beyond its actual layout, there are additional aspects of an overlay’s appearance you should focus on; including size, position on the screen, and how it comes into view (pop-up, fly-in or slide-in). Trying different designs and messages will help you find the combinations that convert best. Remember, you only have a couple of seconds to get the person seeing the overlay to take an action, so make each part of your overlay’s messaging and design count. Although it seems intuitive that you should provide something of value to your audience, you’d be surprised how many overlays offer something that simply doesn’t interest most visitors. So, make sure that you’re offering something of value. Items of value to consider include a free download or free trial, a coupon for later use or an immediate incentive, like a 10% discount or free shipping. Start building your first website overlay today with free AddThis Overlay Tools. 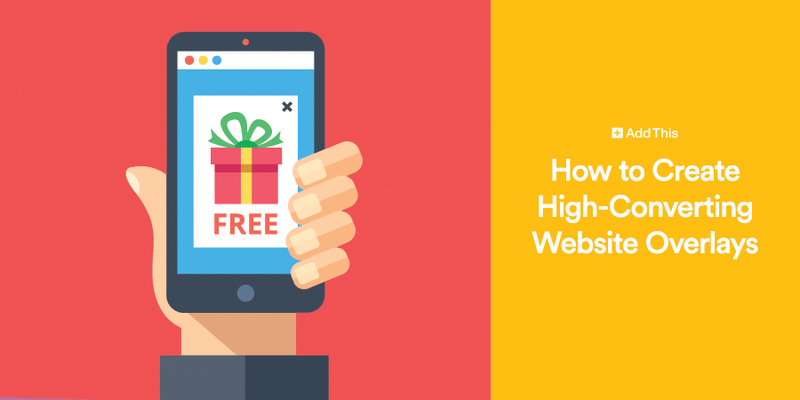 By aligning the message/incentive of the overlay with the content of the page over which it appears, you can increase the chances that the overlay will appeal to visitors and that they’ll convert. Put another way, context is key for the success of your overlay. For example, if you have a blog post on SEO basics for beginners, show an overlay that promotes a full SEO guide. It may take some creative effort to come up with numerous overlays that are relevant for different pages on your site, but this level of page-to-overlay synergy often increases submissions or clicks from overlays. Many overlays now allow for customization by visitor type. In other words, instead of showing the same overlay with the same message to every visitor, overlays can be personalized to better increase conversion rates. In most cases, marketers will be able to craft more effective messages/offers by knowing who will be seeing them. One size definitely doesn’t fit all! One way to do this is to distinguish between first-time visitors and returning visitors. Another is to show different overlays depending on how the visitor reached the site (e.g. from Facebook, Twitter, LinkedIn, a paid campaign you’re running, etc.). Yet another way is changing your overlays based on the country where the visitor is located. In this case, consider using local vernaculars, spellings or even different languages to increase appeal to particular localized sub-groups of visitors. Taking this a step further, you can leverage third-party data about your individual visitors that can give you strong indications about what might interest them. This might sound complicated, but it’s not. Take a look at how you can use interest-based targeting for your overlays with AddThis. Exit Intent: Also known as the “last chance overlay,” this overlay trigger detects when the visitor is about to leave the page/site (usually, when the mouse is moved up to the browser’s toolbar). Upon Entry: Displays the overlay when landing on a particular page, often used for returning visitors for whom the marketer already knows what might be of particular interest. Scroll Activated: A commonly-used trigger that shows an overlay when the user scrolls down past a particular part of the page, also known as scroll depth. After x Page Views: Aimed at more engaged visitors, this overlay triggers after the visitor has navigated through a set number of pages on your website. Time Activated: Time activated overlays trigger after the visitor has spent a particular length of time on a page (or on the site), often measured in seconds. Also, you should experiment with different appearances and frequencies. At an extreme, showing an overlay on every page can annoy visitors and will likely not increase conversions. Test different timings and triggers before showing additional overlays on your website. As mentioned above, it’s important to continuously test the effectiveness of your overlays and optimize them over time. Track relevant metrics with the goal of improving your conversion rates. Just like with other materials, it’s a great idea to A/B test your overlays to see which ones work best. Also, consider using multivariate testing methods that can make it easier to pinpoint which particular aspects of the overlay are having the greatest influence on conversion rates. With the AddThis Overlay Tools, you get analytics that show you clicks and conversion rate, as well as the ability to A/B test the different overlays you have running on your website. Ready to create high-converting website overlays? Check out our free AddThis Overlay Tools.